A couple of weeks ago, we mentioned one of our most recently discovered favorites, Princess Seafood Market & Deli, in a post about the upcoming Crab FEAST Mendocino. We looked at the few little lines we had written and decided, “That CAN’T be all we say about these gals - there’s so much more to tell!” So, we moseyed on up to Noyo Harbor this past weekend to chat with joint owners and best friends Wendy Holloway and Captain Heather. When we walked in to the little Market & Deli, situated in what used to be Nemo’s Fish Market back in the day, we were greeted by several friendly faces – happy team members bustling about getting everything ready for the lunch hour rush, plus some beautifully done portraits of the FV Princess’s crew in action hanging on one wall. Once Heather and Wendy were ready, we went out on their deck, a charming space with a big tent, gas fireplace and heaters, an impressive BBQ, and a massive picnic table that Heather made by hand with an old boyfriend. It was an interesting conversation, with both Heather and Wendy relaxed and happy to share about the fishing boat, the market, and their own personal stories. Heather moved to Fort Bragg as a young girl with her fisherman father and has been fully immersed in the fishing community ever since. She bought her first fishing vessel about 20 years ago and met Wendy, a fish biologist, a few years later in Eureka. They quickly developed a solid friendship, and Wendy became Captain Heather’s first crew woman with an eye to understand the fishing community’s side of the marine conservation question. This brief story of course turned the conversation to how dangerous a job it really is to run a fishing vessel out of Noyo Harbor, where the relatively small boats must battle crazy winter weather, a particularly tricky sand bar at the mouth of the river, and the near chaos of a derby style crab season. Yet in spite of the dangers of nature, the challenges they face from the strict fishing regulations, and the declining populations of salmon and other fish, the captain seems like she’s here to stay. She mentioned again and again how much she loved the close-knit feel of the local fishing community and all the businesses down in the harbor. Wendy too said her favorite part of running the Market and Deli was the community involvement and support, the way so many locals have embraced them and cheered on their progress. Thereupon, Captain Heather jokingly asserted that her own favorite part of running the Market & Deli was actually the unfettered access to free crab sandwiches and beer. 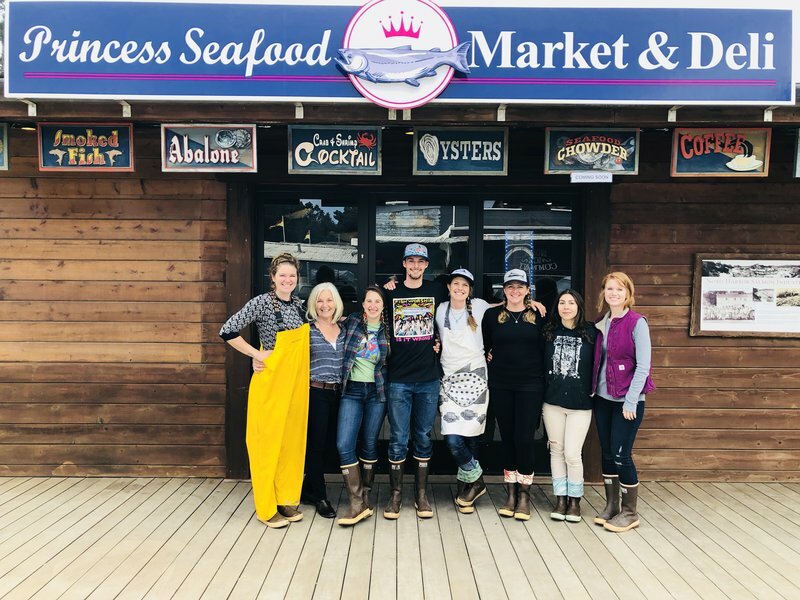 When Wendy and Heather opened shop May 5th, 2018, they were mostly doing it to help keep business flowing during the slower fishing seasons - they hadn’t realized how strongly connected to the local community their market would quickly become. Django’s Rough Bar & Café took them under their wing and started sending musicians their way almost immediately after the market opened, and throughout the summer they had outstanding local acts come and play during the lunch rush on a regular basis. They even got to have Lucky Otis, grandson of the great musical artist Johnny Otis, on their small stage when he was in town for a show at the Sequoia Room. They started sourcing extra fish for the market from several local “little guys,” mom and pop type fishermen who go out with their rods and reels, and there are quite a few neighbors and friends that excitedly come in looking for a particular person’s catch. They established steady relationships with a few restaurants nearby that are committed to resourcing sustainable, high-quality seafood, such as Wild Fish, the Ledford House, and the Harbor House Inn, and they’re constantly searching out new restaurants to partner with. After the conversation drew to a close and we said adieu to the captain and her best friend, we grabbed a bay shrimp salad sandwich from the Deli, and boy are we glad we did! If hearing the story behind Princess Seafood hadn’t already told us they were committed to good stuff and good people, one bite of that sandwich would have made it amply clear. Mmm… We could tell you about it, but perhaps you should just go get one and see for yourself!